It is with great pleasure that I introduce you to Lindsay Fraser, also known as the Chickenless Chick. Lindsay values hard work and creativity in the kitchen and though the following recipe has Louisiana roots, she dabbles in various regional styles, often juxtaposing traditional methods with nontraditional ingredients. Her blog The Chickenless Kitchen, where her motto is “Don’t be a culinary wuss!”, she provides tutorials, recipes, exercises, and challenges to inspire cooks and encourage culinary improvisation. You can find her online through several social networking sites such as “The Chickenless Chick” on Foodbuzz, “Chickenless” on Twitter, and “thechickenlesskitchen” on Delicious. Also, because many people around the world do not have the luxury of being bored with their food, Lindsay is proud to join Cajun Chef Ryan and numerous others in the Blogger Aid community, an organization that raises funds to fight famine around the world. 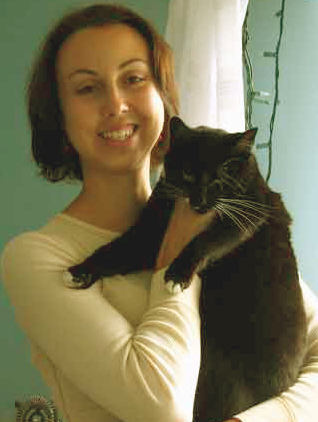 She lives in Orlando, Florida with her loving husband and cat (though the cat pictured is her mother’s). If you like this recipe, feel free to visit The Chickenless Kitchen for more from Lindsay Fraser. Some folks mistakenly believe that blackening goes back to when the first Acadian deportees (the descendants of whom would be called “Cajuns”) arrived in Louisiana. However, as Chef Ryan has previously mentioned on this blog, the first blackened dish was invented in the late 1970s and popularized in the early 1980s by Chef Paul Prudhomme of K-Paul’s Louisiana Kitchen. While hardly a longstanding tradition, blackened seasoning has wedged its way into the repertoires of most Cajun-influenced cooks. My blackened barbeque rub combines the savory kick of Cajun seasoning with bold sweet notes. It’s best with red meat, pork, or dark poultry meats. Here I’ve used that tried-and-true staple of American cuisine, the hamburger. It may be the dead of winter, but here in the South, we know grilling season is just around the corner! In addition, if you live in an environment where there’s six feet of snow on the ground until June, there’s always broiling. You may use an equal amount of pre-mixed Cajun seasoning in place of the first seven rub ingredients. (It comes out to approximately 2 Tbsp.) Chef Ryan is being modest and hasn’t mentioned this in awhile, but his own special Cajun spice blend is available at his General Store and is an outstanding pantry staple for those of us who could often use a delicious meal quickly. I use ground chuck because, to my taste, it’s moist enough to serve on a toasted bun without additional sauces. However, I recommend serving mayo or remoulade on the side in case your guests like it extra juicy. 1. Light your grill or heat your broiler. 2. Mix all burger ingredients well. Shape into six patties. Refrigerate. 3. Mix all rub ingredients together in a bowl. 4. When ready to cook, roll each patty in the seasoning to cover. For medium burgers, grill them over direct high heat or broil them on the highest setting for four minutes on each side. Yum! The blackened barbeque rub sounds amazing! I don’t think I’ve ever had blackened barbeque rub but it sounds wonderful! It would be a great way to enjoy burgers! Great burgers, a family fav , this would be great for the weekend. great post. can’t wait to give them a try! Wonderful post and delicious burgers! The blackened seasoning is something that would work with a vegan Match Meats burger–Yum! And thank you! I love all the spices! I can only imagine this would the burger so much flavor. Excellent!! I like to mix my meat…I use veal, a little bit of pork and extra lean ground. Also have made many bison burgers with the above spices, omitting the sugar, always. 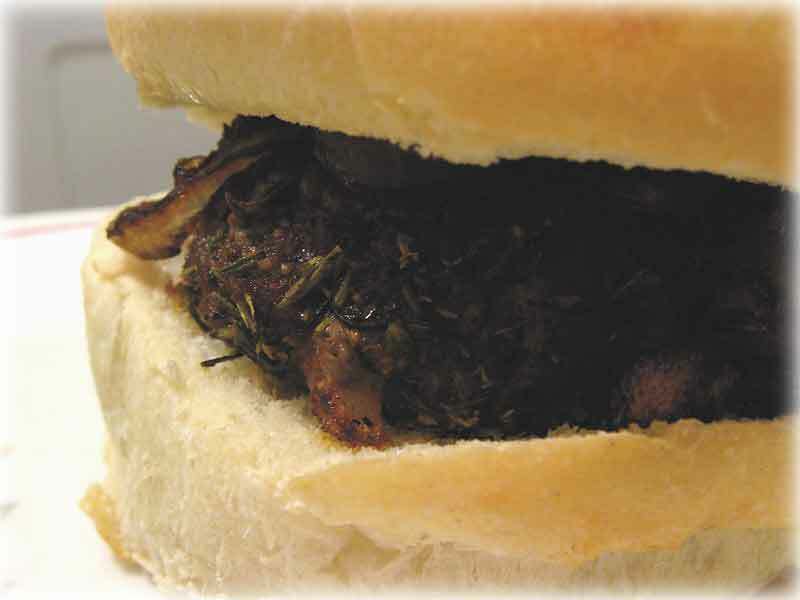 You had me at blackened……….then I was curious what kind of burger the Chickenless Chick would make – and it was BEEF! I was done for! BRAVO! That sounds like one great tasting burger. I don’t know if I would like that blacken barbecue rub. But it looks like it was a hit so I want to try it. Haven’t tasted a blackened burger before but from the overwhelming response, this is a good bet! Thanks again for the wonderful response on Lindsay’s guest post. Just to clarify, traditional blackened foods are prepared on a very hot cast iron skillet or griddle or flat top. The Cajun seasoning is seared into the outside flesh of the food, thus creating the blackened effect. Not to be confused with bronzing….another technique to be touched on later. In the meantime, check out my video on Blackened Catfish here: http://cajunchefryan.rymocs.com/blog2/videos/, or just click the Videos tab above the fold. Congras! And such a lovely recipe. Must be very aromatic too. LOL @Foodo… Showed a buddy this post and his first response was, “Oh no, not kitty burgers!” Alas, boring old beef it is. Thanks all for the kind responses, and thanks again Chef Ryan for having me as a guest! Blackened?! Ooh la la already the name has me intrigued! Must be so intense, and so flavorful! What a treat — two of my favorite bloggers joining forces! Hello, Chickenless Chick! What a tasty recipe. Been thinking of doing burgers at home, but wanted something special — this sounds like just the ticket! What a great rub recipe. Thank you for sharing. Been craving some burgwers after the long trip abroad!